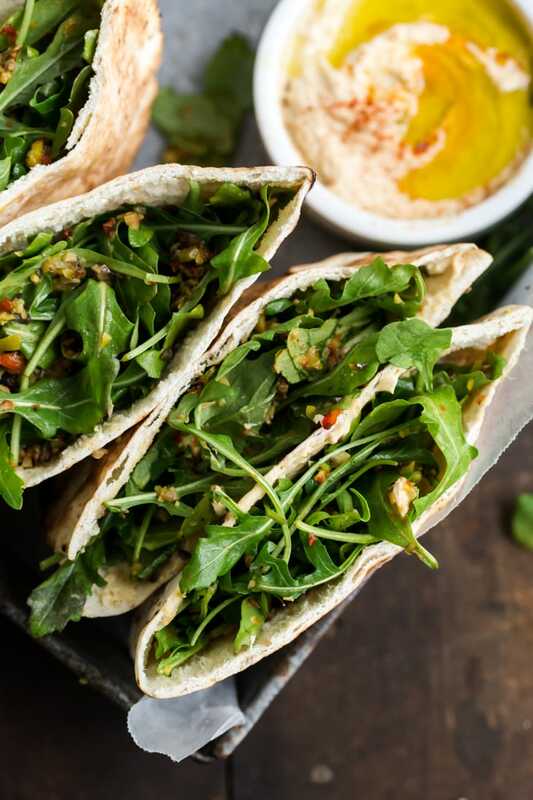 Olive Tapenade and Hummus Stuffed Pita | Naturally. Some time ago, I did a brief reader questionnaire about what you guys might like to see more of and the answer was pretty much: everything! (as long as it’s not overly complicated.) I try hard to share easy (easier) recipes but I think one area I lack is in the lunch department. Even when I was working outside of the house, I kind of stunk at packing my own lunch. I never felt creative and I’d often just throw a sandwich together or grab a bite to eat elsewhere. The worst was when I worked for a plumbing company as their bookkeeper/only office worker and couldn’t easily leave the office to go grab something (I was in the middle of nowhere and it was needlessly complicated to forward the phone to my cell). Now that I work at home, I eat a bit better but I still get it ruts. I thought it would be a magical time of my day when I took an hour lunch, whipped up some wonderful lunch, and relaxed. Turns out, most days I look at the clock around 1:30 and think “crap! I forgot to eat!” I love stuffed pita because they are quick, a bit nicer to eat than a sandwich, and travel well. Pulse garlic in the food processor until minced. Add olives, roasted red pepper, olive oil, sea salt, black pepper, and lemon juice. Pulse until olives are in small pieces. Measure out 6 tablespoons of the tapenade and save the rest for another use (pizza, grilled cheese, or topping morning eggs- just for a few ideas). 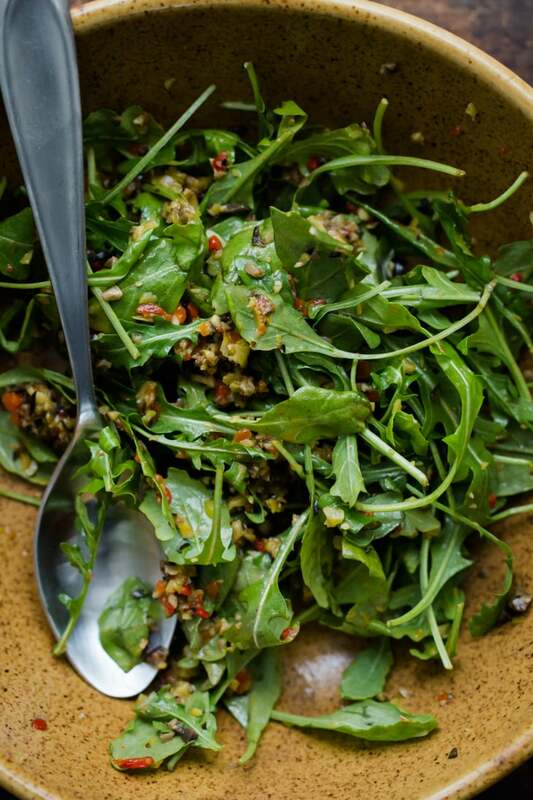 In a bowl, toss arugula with the 6 tablespoons of tapenade until well combined. Slice the pita in half and carefully pry open the pocket, being careful not to tear. Spread 1 to 2 tablespoons of hummus along one side and stuff with 1/4 of the arugula mixture. Repeat with the remaining 3 pita halves. Yum! This would be great for using up a giant jar of (garlic-stuffed) olives I have collecting dust in the fridge. I feel like tapenade is an often-forgot classic! Thanks for brining it back. Ha! Sounds about right. More easy recipes of allllll the stuff! Happy to see this one today – looks awesome! Oh yum, olives are one of my favorite foods. My dad makes a tapanade that’s pretty similar to this, but I’ve never had it with hummus- what a great combination! I am such a fan of pitas! Especially ones involving hummus, and this olive tapenade sounds delish. My lunch game is either excellent or downright lazy, haha. Can’t wait to add this to the lunch roster! This looks amazing – perfect for lunch! The photo made me want to dive right in. 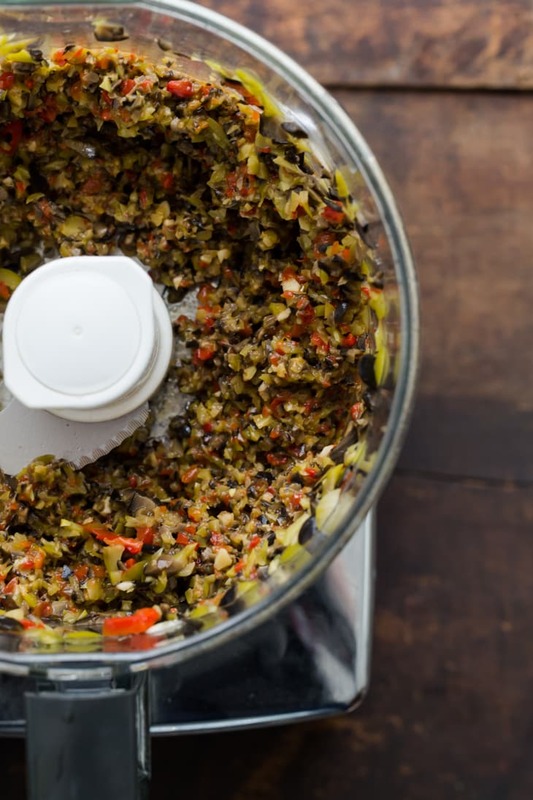 Tapenade has long been a favorite of ours, but I usually buy it. Your recipe seems easy enough to tackle. But, I have often wondered, are the black olives to which yu refer the typical ripe olive you find on so may buffets, or do you use a black Greek olive such as the yummy flavored Kalamata. I would imagine that the flavor profile would be different depending on which oive you use. Thanks for your time. I typically use black (like what you would find on the salad bar) only because I’ll often pick up cans of olives and getting Kalamata isn’t often an option. Kalamata are by far my favorite, but I can’t say I’ve ever seen them not already cured with spices + oil! My lunches almost always consist of leftovers from the night before, as I deliberately plan to make more than enough for the cook once, eat twice policy. So when I don’t have leftovers I agree that it is challenging to think of the right thing to whip up that is fresh and takes little time. 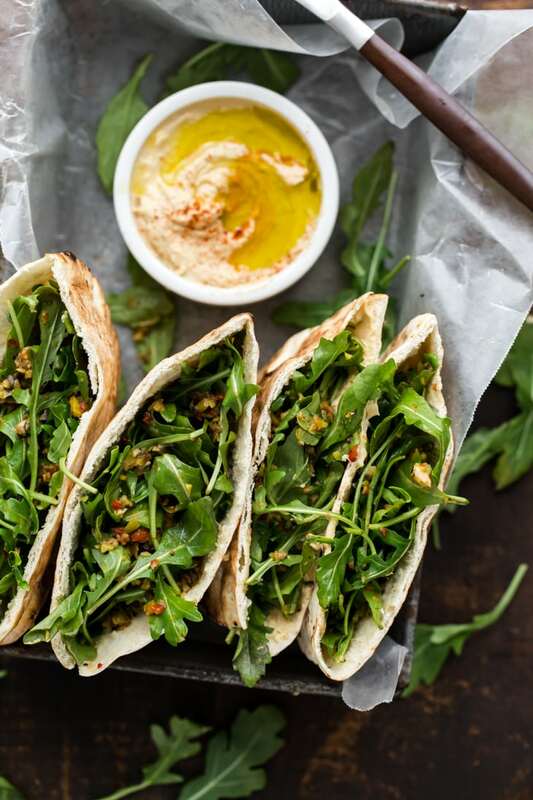 I like this tapenade-stuffed pita idea, especially because the tapenade probably stores well in the fridge for several days. Easy recipe is where it’s at! Thanks for sharing these stunning pictures. Yes yes yes, I am making this filling when I bake some pittas this week – this looks delicious! This looks delicious! So fresh and yummy. You’re pics are gorgeous! If it’s wrapped in pita, chances are, I’m going to go crazy about it! And this recipe is no exception. This looks really delicious! Hi .. we have many many jars of our homecured calamata olives. even from 2012 and we only have one tree.. so this is agreat recipe to use them up . Thanks. Enjoy your posts and chats… I too in a rut for lunch.. usually fresh ricotta cheese and salad.. summer and winter. sometimes have canned sundried tomato tuna with couscous and fresh tomatoes and cucumbers…. but bread is what I like the most but try not to eat too much of it at lunch!! I made these and had them for lunch yesterday. Wow! so tasty. This looks delicious. I’ll be making this sometime this week. Yum!! Oh love this idea! Olives add so much flavor and I bet it’s so good with the peppery arugula! Wow this looks so delicious! I have to try it this week! I love olives and hummus! Hello heaven! YUM– looks delicious! I made this for lunch today! My coworkers were all eyeing it. I did add chicken for a little extra protein and I used whole wheat naan because the store was out of pita. What a yummy healthy lunch! I was just wondering how long this tapenade should keep? I made some last week and haven’t been able to use it all and I really don’t want it to go to waste! I usually get about a week out of it, but it might last for a bit longer! The taste of this recipe is delicious. I made this recipe for dinner my husband and children really like this recipe. Thanks for sharing this recipe. Love the article, and the recipe. I had to laugh at you saying at 1.30pm that you forgot to eat lunch again – here in Spain nobody even starts thinking of making lunch till 1.30pm or eating lunch before 2pm! This was delicious!! Thank you so much for the idea!! Cant wait to have for lunch again!